Welcome to Oklahoma City, Capital of the New Century. This is an active, activity-filled city. One that enables its residents to enjoy an exceptional quality of life. Oklahoma City’s hip, spirited environment blends with its deep western heritage, creating an exciting destination steeped in culture and adventure. Discover all of the things to do in Oklahoma City, including renowned festivals, national sporting events, and treasure-filled museums. Explore the variety that OKC’s districts offer, including arts and entertainment, shopping, history & heritage and more. The possibilities for fun in Oklahoma City are endless. 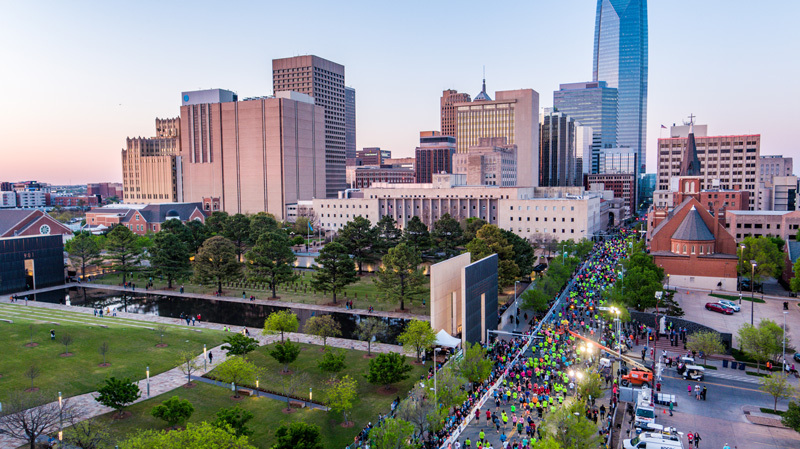 The Memorial Marathon events and Start/Finish Lines are all conveniently located in downtown Oklahoma City and are within walking distance of hotel and the local entertainment districts! 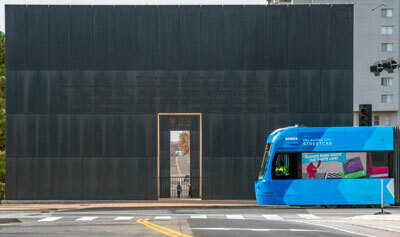 Plan to spend the entire weekend in Oklahoma City, check out the Downtown Walking Tour and our Downtown Restaurants. To learn more about what Oklahoma City has to offer, go to VisitOKC.com or the Apartment Locator Guide to Downtown OKC! Marathon Partner hotels offer special rates for Marathon participants, use the button below to take advantage and book your room. On race morning, official Oklahoma City Memorial Marathon shuttles sponsored by Chickasaw Nation will be providing complimentary transportation to and from hotels, and to the Relay Exchange Zones. We encourage you to use these shuttles race morning as there is limited parking in the downtown area and near the Relay Exchange Zones. Staying downtown? The Streetcar will be running from 4am to 6am and is a great way for those staying in Bricktown to get to the Start Line! Starting at 4:30am, shuttles will be making continuous loops along the Marathon partner hospitality hotel locations. Shuttles will only be stopping for runners at the hospitality hotels, not spectators or volunteers. Shuttle information will be posted in the hotel lobby, and you can hop on at the designated Runner Pick Up site marked by an Oklahoma City Memorial Marathon shuttle flag. Please keep in mind that depending on where your hotel is located, it could be anywhere from a 15 to 45 minute ride. Be sure to leave on a shuttle based on when you would like to arrive at the Start Line and allow time for any potential traffic along the way. It is the responsibility of the runner to plan their trip to the Start Line so that they arrive well before 6:30am or in time to make it to their designated exchange. New this year, Shuttles will drop off runners at NW 5th and Dewey, 2 blocks west of the Start Line. From there, runners can catch a Relay Exchange shuttle or walk to the Start Line! Meridian Avenue & Northwest Expressway Hotels Shuttle service beginning at 4:30am and continuing until 6am. Embassy Suites Medical Center One pick up only at 5am. 21C Museum Hotel One pick up only at 5:15am. Also new this year, after crossing the Finish Line, you can return to your hotel by meeting on Ron Norick Blvd between Sheridan and Reno in front of the Gear Check. Shuttles will begin transporting runners back to partner hospitality hotels at around 10am. The last hotel shuttle will run until approximately 1pm.